“The cuckoo shouts all day at nothing in leafy dells alone, – And traveller’s Joy beguiles in autumns hearts that have lost their own.” – A. E. Houseman. 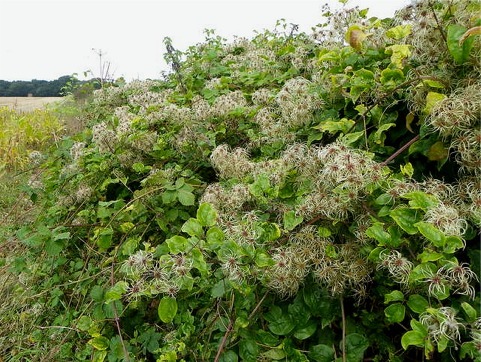 Clematis vitalba – As its name suggests this plant is a member of the clematis family and can be seen virtually everywhere on the lower tracts of Dartmoor. From wild hedgerows to woodland edges and walls to garden hedges. The plant is commonly known on Dartmoor as Traveller’s Joy or Old Man’s Beard but also goes under the names of; Aaron’s Beard, Bushy Beard, Daddy’s Whiskers, Goat’s Beard, Boy’s Bacca, Smokin’ Cane and Devil’s Cut. The leaves consist of three to five leaflets that are elliptical in form with roughish toothed edges, they grow in an opposite leaf arrangement. The flower clusters smelling of vanilla appear form July to August and consist of white sepals which grow to about two centimetres in length. The fruits appear in the autumn as seed clusters (called achenes) that take on a greyish feathered appearance the seeds are then disseminated by the wind. It is this resemblance to the various forms of beards that gives the plant the ‘hairy’ names. 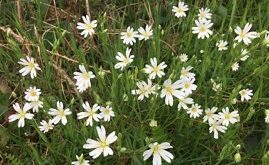 Once Traveller’s Joy takes hold it can soon smother its host as its stems can spread up to thirty metres or more and for this very reason is considered to be an ‘invasive’ plant. The plant climbs by means of its leaf stalks which entwine around any convenient branch, stem or twig. Next, ‘Boy’s Bacca‘, ‘Gipsie’s Bacca‘ and ‘Smokin’ Cane‘ – it was not unheard of for young boys to dry the stems and ‘smoke’ them in an attempt to mimic the adult tobacco smokers. In the case of poor countyrfolk the stems were smoked as a cheap and easily attainable substitute for tobacco. There was one slight problem with smoking the stems insomuch as the sap contains a toxin called protoanemonin. When in contact with the skin it can cause itching, rashes or blistering so unless the stem had been thoroughly dried the result of smoking them would be painful. It is said that the tramps and beggars of old would purposely apply freshly cut stems to their skin in order that the ensuing blisters would give them a distressed appearance thus receiving the sympathy of those he came into contact with. However the stems toxic effects are neutralised when exposed to heat or dried completely. Finally the rather ominous name of ‘Devil’s Cut‘, this name came about because some folk believed the plant was sent from the Devil to smother all the other plants it came into contact with. The Traveller’s Joy plant has several uses, sometimes the stems would we woven into a chord that would then be used to bind sheaves of corn as it was thought that rodents wouldn’t gnaw on them. Occasionally around the moor you would find find farm gates fastened with lengths of twine made from the plant. Further away from the moor in coastal regions the stringy stems would be used for making the bottom of crab pots. In the so-called language of flowers the Traveller’s Joy represents safety and security and for this reason was sometimes included in bridal bouquets. Clusters of Traveller’s Joy provide a source of food for a variety on animals, moth larvae and butterfly caterpillars dine on the leaves whilst bees and hoverflies are attracted to the pollen and later in the year goldfinches and green finches are particularly partial to the seeds.